The PTO sponsors the sale of spirit wear to foster school spirit between our students, parents, faculty and staff to enhance the overall Ben-Hem experience. Wearing Spirit Wear helps to bring visibility to Ben-Hem in our community, and is fun to wear for spirit-building events throughout the year. Traditionally, Spirit Wear has not been used as a fundraiser at Ben-Hem. Prices are set as close to the cost to make it easier for members of our community to purchase. To ensure the lowest cost, highest quality and best variety of clothes with the Ben-Hem school logo, we have set up a school store with Lands End. PURCHASE BEN-HEM LOGO WEAR ANYTIME! You can purchase clothing anytime of the year by visiting http://www.landsend.com/school and entering our Preferred School Number: 900153040. Active wear (t-shirts, sweatpants, sweatshirts, etc) will have a high-quality, large or small heat-transfer logo applied to them. Dressier clothing (sweaters, polo shirts, jackets, etc) will be embroidered with the Ben-Hem logo. Be sure to keep an eye out for sales! Lands End often has deals offering 30-50% off regular priced items (and free-shipping over $50 orders). Please note that item based sales usually do not get applied to the heat-transfer/embroider fee. In addition to logo wear, each year, Ben-Hem students are asked to submit design ideas for a themed Spirit Shirt. The winning shirt design will be printed on different shirt colors and offered as an "exclusive" during this year's Spirit Wear sale. The 2018 Spirit Wear Shirt Design winner is 1st grader Ilaria Mastantuono in Ms. Lyons's class. Congratulations, Ilaria! The winning design concept was used to create this year’s exclusive Spirit Shirt and is available to purchase now at the Ben-Hem Spirit Store. The shirt is available in 7 colors -- view all colors online. The spirit shirt is only available once a year —> order by January 11 at http://benhempto.3dcartstores.com/ or use the attached order form. Each Year, Ben-Hem students can submit their design ideas for consideration as the next Spirit Shirt. Next year's contest submission deadline will be announced in the October time frame. - Draw your design on an 8.5 x 11 piece of white paper. 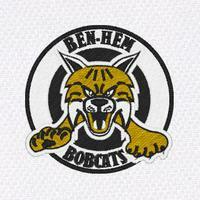 - Your design must somehow feature our school mascot - Benny the Bobcat. - Make sure to color your drawing to impress the judges. Entries will be judged based on the best SHIRT design idea, not drawing ability. - On the back of your design, write your Name (first and last), Grade, and Teacher's Name. - Then, put your design in an envelope marked "PTO - Spirit Shirt Design" and give it to your teacher. - Design ideas will be voted on by the PTO Board on (TBD). - The winner will be announced via Facebook and the Bobcat Bulletin. - The winner's idea will be used to create the Spirit Shirt design which will be available for sale with other Spirit Wear offerings. The contest winner will receive a FREE Spirit Shirt.